Macroalgae are taxonomically classified into four different Phyla: Rhodophyta (from the Greek 'rhodon' meaning 'red rose' and 'phyton' meaning 'plant': red algae), Ochrophyta (Class Phaeophyceae, from the Greek 'phaios' meaning 'brown': brown algae), Chloro-phyta (from the Greek 'chloros' meaning 'green': green algae) and Cyanobacteria (from the Greek 'cyanos' meaning 'dark blue': blue-green algae) (Table 15.1). This systematic classification is based on the composition of pigments involved in photosynthesis. together with the northern Australian coast, is one of the lesser known floras on the Australian continent. 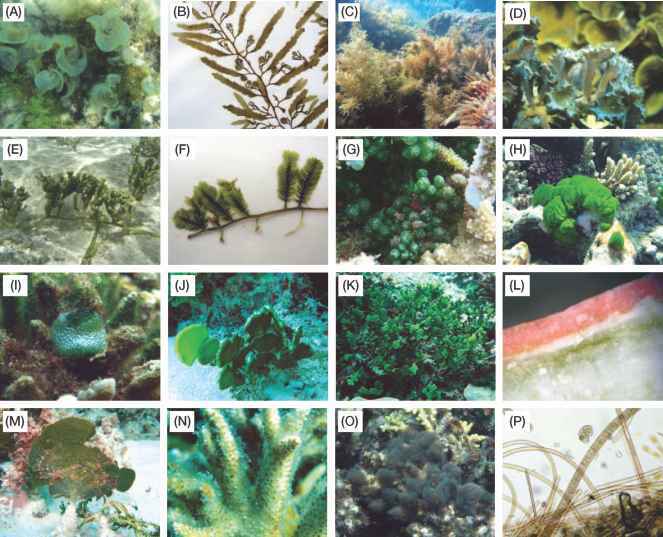 The Rhodophyta are the most diverse phylum for the GBR, with 323 species contained in 131 genera, with Laurencia (27 species), Polysiphonia (19) and Ceramium (16) the most speciose. There are 111 species of Phaeo-phyceae, with more than 50% of the species belonging to Sargassum (47 species) and Dictyota (11). Thirty-two genera of brown algae have been recorded for the GBR. The Chlorophyta include 195 species in 51 genera, of which Caulerpa (36 species), Halimeda (23), and Cladophora (19) contain the highest number of species. Besides traditional species classification, macroalgae can also be classified based on ecological terms following a functional form group approach. This approach takes into consideration key plant attributes and ecological characteristics, such as the form of the plant, size, plant toughness, photosynthetic ability and growth, grazing resistance etc. Functional group classification is helpful in understanding the distribution of algal communities and their responses to environmental factors, since morphologically and anatomically similar algae have similar responses to environmental pressures regardless of their taxonomic affinities. The functional approach is useful particularly when identification to species level is not possible and consequently has been widely used in ecological studies on coral reefs of the GBR. • Algal turfs. Assemblages or multispecies associations of minute filamentous algae and the early life history stages of larger macroalgae, with high productivity, fast growth and colonisation rates. Turfs are ubiquitous and have low biomass but dominate much of the reef framework's surface. Analogous to some grasslands in terrestrial environments, turfs owe their continued existence to herbivores that graze on them, thereby preventing overgrowth by fleshy macroalgae. The term 'epilithic algal community' or EAC is often used to refer collectively to the algal assemblage that grows on the substrate; usually this refers to an assemblage dominated by filamentous algal turfs. • Upright macroalgae. Large algal forms, more rigid and anatomically more complex than algal turfs, abundant in zones of low herbivory such as the intertidal, reef flats, or inshore reefs where strong wave action, heavy predation, or water quality limit grazing. They often contain chemical compounds that deter grazing from fishes. • Crustose algae. Calcareous plants that grow completely adhered to the substrate forming crusts, with slow growth rates in general, and are abundant in shallow reefs with high herbivory pressure. This group includes species from the families Peyssonne-liaceae and Corallinaceae. The algal flora of the GBR belongs to the Solanderian biogeographical province in terms of the benthic algal flora of Australia. This province is less diverse when compared to southern Australia (Flindersian province) and New South Wales (Peronian province). Endemism on the GBR is low, since most species are widely distributed in the Indo-East Pacific biogeographical region, and many GBR species are also thought to be present in the tropical Atlantic. However, recent studies using DNA markers has revealed that some of the species that look identical are actually distinct. The distribution and abundance of macroalgae on coral reefs are determined by the resources they require (i.e. light, carbon dioxide, mineral nutrients and substrate), the effects of environmental factors (e.g. temperature, salinity and water movement), individual rates of recruitment, mortality and dispersal, and biological interactions such as competition and herbivory. Macroalgal communities of the GBR are highly variable, showing latitudinal, cross shelf and within reef variation in composition and abundance. Many GBR macroalgae are also highly seasonal. Cross shelf distributions - offshore and inshore reefs. Offshore reefs usually have low abundance of fleshy macroalgae and high cover of algal turfs and crustose calcareous algae (CCA) compared to inshore reefs. Some fleshy macroalgae, such as the green fleshy macroalgae Caulerpa, Chlorodesmis, Halimeda, and the reds Laurencia, Galaxaura and Liagora are common in offshore reefs but in low abundance. 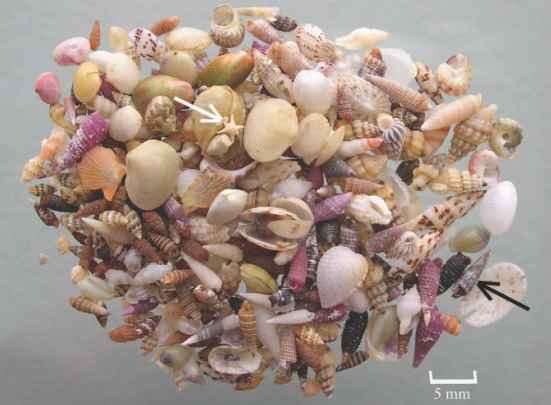 Crustose calcareous algae are abundant and diverse on offshore reefs and play significant roles in reef construction. Common taxa on offshore reefs include the CCA Porolithon onkodes, and species of Neogoniolithon and Lithophyllum. The cross shelf distribution of the algal functional groups is predominantly affected by fish grazing and water quality (nutrient availability and sedimentation). Inshore reefs usually have abundant and conspicuous stands of fleshy macroalgae. In particular, brown macroalgae of the Order Fucales such as Sargassum, Hormo-physa, Turbinaria and Cystoseira, form dense and highly productive beds of c. 2 m height. Other fleshy brown macroalgae such as Lobophora variegata, Dictyota, Col-pomenia, Chnoospora and Padina and the red Asparagopsis taxiformis, may also be abundant in shallow inshore reefs. Lobophora variegata can be particularly abundant in inshore reefs, especially between branches of corals and after coral disturbance such as bleaching. Crustose calcareous algae are common but are not abundant. Particular microhabitats such as crevices and the territories of damselfishes play important roles in locally increasing the diversity of fleshy and turf algae. Inter-reef areas and Halimeda beds. Macroalgae associated with seagrass beds, particularly in deep, soft-bottom areas of the northern GBR are quite abundant. In contrast to seagrasses, most algae do not attach to sand, although a number of green macroalgae have adapted to such environments by developing special anchoring features. This is the case for green algae such as Halimeda, Caulerpa and Udotea, commonly found intermixed with seagrasses. Macroalgae growing on leaves of seagrasses are called epiphytes and may play important roles as food for invertebrates and vertebrates in seagrass meadows. Halimeda mounds grow in nutrient rich upwelling water in between reefs that make up the outer barrier reef (see Box 15.1). Blue-green algae Halimeda spp. Caulerpa spp. Seaweeds are abundant in the deep water, inter-reefal areas of the northern part of the GBR. Large mounds formed from the green calcareous alga Halimeda are estimated to cover up to 2000 km2 in this region and may be up to 20 m high. These Halimeda meadows occur principally in the northern sections at depths between 20 m to 40 m, but there are also some in the central and southern sections of the GBR, where they have been found at depths down to 96 m. The GBR apparently contains the most extensive actively calcifying Halimeda beds in the world, although the real extent of such meadows is unknown. Tidal jets and localised upwelling events in the northern section of the GBR provide the nutrients needed to sustain extensive deep (30-45 m) meadows of Halimeda. Macroalgae used for taxonomic purposes should be collected with the anchoring systems and preferably with reproductive structures. Macroalgae can be preserved in a solution of 4% formalin or in ethanol 70% (although decolouration may occur). However, dry herbarium specimens are easier to use and transport. White cardboard acid-free sheets are used for mounting specimens. Each herbarium sheet should contain basic information on the locality of collecting, date, depth, habitat, colour, and the collector's name. Permits are required, see Chapter 12. The abundance, growth and reproduction of many GBR macroalgae are highly variable in time. Large seaweeds like Sargassum are strongly seasonal, with peaks in biomass and reproduction generally during the summer and lowest biomass during the winter. Extensive blooms of fleshy brown macroalgae like Chnoospora and Hydroclathrus are common on shallow reef flats during winter. Due to these strong seasonal changes, some authors argue that the seasonality of the GBR flora may be as strong as that from temperate zones. 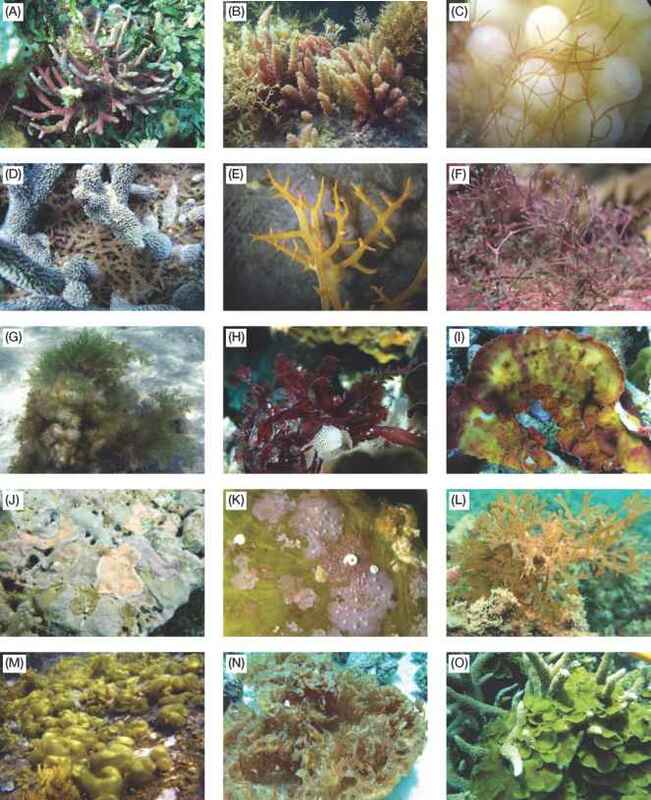 Identification of coral reef macroalgae to the genus level is relatively easy, but the identification at the species level is more difficult and generally requires examination under a compound microscope (see Box 15.2 for preservation methods). The reproductive structures, internal tissues, cell organisation, and so on, are key features required for rigorous species identification. • Amphiroa: heavily calcified, branches cylindrical to flattened, composed of smooth segments linked by very short non-calcareous joints. Pale pink to red, also called geniculated Corallinaceae. Common throughout the GBR (Fig. 15.1A). • Asparagopsis taxiformis: plants soft, with creeping stems and upright fluffy or feathery tufts. Bright pink and common on inshore reefs (Fig. 15.1B). • Corallophila: red filamentous alga with creeping axes and erect branches with pointed tips, usually found overgrowing corals (Fig. 15.1C). • Eucheuma: similar to some species of Hypnea but the thalli are tougher and rubbery. Sometimes found between branches of branched Acropora corals (Fig. 15.1D). • Galaxaura: lightly calcified, dichotomously branched, branches cylindrical or flattened, smooth or hairy. Pink to red, sometimes with chalky appearance. • Hypnea: branches cylindrical and generally bearing numerous relatively short spine- or tooth-like branchlets with pointed tips. Colour variable from pale brown to dark purple. Usually between branches of hard corals (Fig. 15.1E). • Jania: heavily calcified, similar to Amphiroa but plants are smaller (few mm) and branches are predominantly cylindrical. Widespread in shallow and deep reefs (Fig. 15.1F). • Laurencia: plants generally bushy, branches usually cylindrical with blunt tip branchlets. Colour variable, some with green branches and pink tips, others ranging from orange, red to pink. Common on reef flats (Fig. 15.1G). • Melanamansia: red to reddish-brown, branches leaflike and grouped in rosettes, with marginal teeth. Generally found on crevices and other low-light microenvironments (Fig. 15.1H). • Peyssonnelia: encrusting, rounded to fan-shaped plants. Calcification on the lower side and fleshy surface. Colour variable, dark red, purple pink or red yellowish. Common on overhangs and cryptic microhabitats (Fig. 15.11). • Porolithon: encrusting, heavily calcified with chalky texture. Pink crusts of several mm thick. Common on the reef crest (Fig. 15.1 J). Other crustose coralline algae are epiphytic (grow on the surface of other benthic algae) (Fig. 15.1K). • Polysiphonia: filamentous, usually a few mm tall, examination under the microscope shows cylindrical polysiphonous branches with a 'banding' appearance, similar to Sphacelaria. Pink to red, red-brown or brown. Common and abundant on algal turfs. • Dictyota: plants creeping or erect, flattened, strap or ribbon-like (without midrib as in Dictyopteris). Branching dichotomous (forked). Light brown and several species with blue-green iridescence. Common (Fig. 15.1L). • Chnoospora: plants forming mats or cushion-like clumps, branches are slightly flattened and dichoto-mous. Light brown. Common on reef flats. • Colpomenia: plants rounded or irregularly lobed with hollow interior. Light to pale golden brown. Common on inshore reefs (Fig. 15.1M). • Hincksia: small (few mm) filamentous plants, fine, erect, uniseriate (one row), pale yellowish and translucent. Reproductive structures (sporangia) somewhat corn cob-like. Common on algal turfs. • Hormophysa: similar to Sargassum but blades with internal oblong air bladders. Yellow to dark-brown. Common on inshore refs. • Hydroclathrus: light to pale golden brown, net-like structure, perforated. Common on calm and sheltered waters (Fig. 15.1N). • Lobophora variegata: creeping, rounded to fan-shaped plants, sometimes encrusting. Pale to dark brown and usually with concentric bands and radiating lines. Common to locally very abundant, particularly between branches of corals (Fig. 15.10). • Padina: upright, sheet-like, fan-shaped plants, with concentric bands and also whitish bands due to carbonate deposition. Similar to Lobophora but has characteristic inrolled outer margin. Common on reefs flats (Fig. 15.2A). • Sargassum: plants erect, leathery, some up to a couple of metres are the tallest seaweeds in the GBR. They typically have a stipe, leaf-like fronds with a midrib (central vein), and air vesicles or floats. Very abundant on inshore reefs (Fig. 15.2B, C). filament. One of the most abundant taxa of algal turfs. • Turbinaria: plants erect, tough, leathery, with closely placed top-shaped branches with spiny margin, each containing an embedded air bladder. Common on reef flats (Fig. 15.2D). • Caulerpa: all species have a creeping stolon attached by rhizoids and erect green branches or fronds. Fronds are very variable including leaf- and featherlike, others have cylindrical to club-shaped, spherical-like branchlets. Common on sandy and reef bottoms from shallow and deep reef (Fig. 15.2E-G). • Chlorodesmis: plants forming tight clumps or tufts of repeatedly forked filaments. Bright green and common on shallow reefs (Fig. 15.2H). • Dictyosphaeria: plants spherical to irregularly lobed, light green, surface hard and tough composed of one layer of angular or polygonal cells, resembling a honeycomb. Hollow to solid inside depending on the species. Common (Fig. 15.21). • Halimeda: plants erect, lightly to heavily calcified, pale to dark green. Branches formed by calcified segments separated by deep constrictions. Segments can be flattened (triangular to discoid or kidney-shaped) to cylindrical (Fig. 15.2/, K). • Ostreobium: microscopic green filaments, cylindrical to inflated, usually within skeletons of healthy and dead corals and other carbonate substrates. Widespread on deep and shallow reefs (Fig. 15.2L). • Udotea: upright calcified, stalked and fan-shaped plant, anchored to the substratum by a rhizoidal mass. Grey-green (Fig. 15.2M). • Ulva: bright green, sheet-like or membranous blades. Uncommon on reefs. Species of Enteromorpha (now belong to the genus Ulva) are small (a few mm) and have the form of a hollow tube; common on algal turfs. • Ventricaria: globose plants up to several cm in diameter. Glossy dark green with bright reflective glare. Usually epiphytised by pink crustose calcareous algae. Common throughout the reef. Macroalgae reproduce either asexually or sexually. Asexual reproduction involves the release of spores (propagules) or by fragmentation (pieces of plant braking off to produce new individuals). In sexual reproduction, male and female gametes are released into the water, however, there are some examples where female gametes are retained by the parent and the resulting embryo develops (at least temporarily) on the parent gametophyte. Macroalgae have complex life cycles, of which there are three types in coral reef algae. (1) haplontic life cycle (meiosis of a zygote occurs immediately after karyog-amy); (2) diplontic life cycle (the zygote divides mitoti-cally to produce a multicellular diploid individual), and (3) diplobiontic life cycle or alternation of generations (the haploid and diploid phases are alternated, each phase consisting of one of two separate, free living organisms: a gametophyte, which is genetically haploid, and a sporophyte, which is genetically diploid). What species of padina with a hairy and chalky appearance?